First Line: The first execution I attended wasn't by lethal injection but by Old Sparky. When her former partner, Laura Coleman, asks for her help, ex-FBI agent Brigid Quinn leaves her home and husband in Tucson, Arizona, and heads for her childhood home of Florida. Laura is on leave from the Bureau and has been volunteering for a legal group trying to prove the innocence of a man who is on death row for killing his family. Laura is convinced the man is innocent. Brigid isn't so sure. The date for his execution is coming up fast so they have to work quickly. There's only one thing slowing Brigid down: her father is ill and in a local hospital. I have read and enjoyed Becky Masterman's previous two Brigid Quinn books Rage Against the Dying and Fear the Darkness, and I really looked forward to A Twist of the Knife. While still a strong book, I didn't find it quite as enjoyable as the other two. I think one of my problems was the fact that I missed two things quite a bit: the Tucson setting of the other books, and the absence of Brigid's husband Carlo. Carlo is such a wise, strong, comforting presence that Skyping and phone calls just didn't cut the mustard for me. Perhaps it's because I identify too strongly with Brigid, another woman who found the love of her life after the age of fifty. Watching Brigid become accustomed to sharing her life with another person has been a pleasure for me. Due to the scheduled execution date of the condemned man, the action of A Twist of the Knife takes place within a very short period of time, and Brigid has to go nonstop in order to take care of both her parents and of her share of the investigation. Masterman made me feel as exhausted as Brigid had to be. Family dynamics play a crucial role in this book. After all, the man is on death row for killing his family, and we have the added drama of Brigid's own family web of secrets. Her relationship with her parents has always been troubled, and we learn the reasons why. Her father is gravely ill. Her mother is acting very strangely. She's unhappy with her brother Todd who's ignoring his father's illness and concentrating on the same investigation on which his sister is working. Many times it felt as though Brigid's own family situation was working against the subplot of proving (or disproving) the condemned man's innocence, and this weakened both storylines for me a bit. 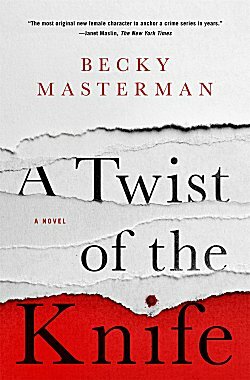 A Twist of the Knife is still a good, strong book with a main character I'm addicted to. How can I resist a woman who's seen so much evil, who's experienced so much, and who now believes that "we're all mysteries that can't be solved"? Author and book both new to me. I enjoyed your take on this.